“You’re wrong, Phil Collins is kickass sometimes!” – Rock of Ages (Broadway Musical). And not just because he makes awesome music but also he’s a staple of endurance. In 2005, Collins announced “The First Final Farewell Tour” and the cheeky title was an indication that he might return for more. In the years that have gone by, life has been tough for Phil Collins – from losing the ability to play drums due to nerve damage and separation from wife to severe drinking problems, he suffered a lot but also endured. The proof of this is the 2018 North American leg of his “Not Dead Yet Tour.” Fresh Phil Collins tour dates have been announced and the comeback trek has taken the fans by storm. So buy your Phil Collins tickets before they are all sold out. Well, for starters, Phil Collins has already hung his drumsticks for good. The nerve damage no longer allows him to play the drums, and the same has even affected his ability to stand for a long time, which is why Phil Collins live concerts see him sitting on a chair whilst performing. What makes the “Not Dead Yet Tour” not so different is Collins’s voice – which is stronger than ever and can still touch the soul. His first solo tour in 12 years, the Rock and Roll Hall of Famer will stop in fifteen cities and is already raking in a huge demand for Phil Collins tickets. Kicking off in October, Phil Collins concert in BB&T Center in Fort Lauderdale, Florida is expected to be a sold-out event. Celebrating Collins’s expansive career and his 2016 memoir “Not Dead Yet,” the tour will feature Daryl Stuermer, the longtime guitarist, keyboardist Brad Cole, the bassist Leland Sklar and percussionist Luis Conte. Perhaps the proudest moment for the singer will be to take the stage alongside his teenage son Nicolas, who will be rocking the drums. Though battered and bruised, Phil Collins performs with the same energy he did back in his hey days. His voice retains the sultriness; it’s soulful during poignant lyrics and powerful when he’s rocking those cinematic ballads. Collins has held his own – he fought depression, overcame suicidal thoughts and bounced back rather positively from the devastating news of never playing his favorite instrument ever again, and that’s why he is still kickass. The tickets for the North American leg are selling out fast, so make sure you get them in time to attend a rocking show by the Grammy Award winning musician. Phil Collins was the backbone of the British rock band Genesis and later soared in his solo career. He steered the Genesis to newer heights at a time when the original frontman Peter Gabriel packed his bags and started his own career. During the 80s, he ushered the movie soundtrack scene into a new era, composing epic movie ballads like “Separate Lives” and “Against All Odds.” The romantic ballad “In the Air Tonight” remains one of the best love songs of all time, and not just because it featured Tom Cruise and Rebecca DeMornay doing the deed on subway in “Risky Business”. The track is driven by haunting lyrics and some mind-blowing drum solo. Lucky fans with Phil Collins tickets for his “Not Dead Yet Tour” will also get to enjoy the live rendition of “You Can’t Hurry Love” and “Against All Odds”. Collins will also be performing his classic numbers like “In the Air Tonight” and “Take Me Home”. Phil Collins perhaps just wants to feel the love once last time with his fans, but the feeling is definitely mutual, as witnessed from the deafening applause he gets at every concert. Phil Collins – the fans Can’t Stop Loving You. Phil Collins fans are in for a treat as the multi-talented music artist will be bringing his tour Still Not Dead Yet Live! to the US this fall. The itinerary includes fifteen dates so far. Joining the vocalist and drummer on the road would be bassist Leland Sklar, guitarist Daryl Stuermer, percussionist Luis Conte, keyboardist Brad Cole as well as Phil’s son Nicolas Collins on drums. The trek kick starts with a performance at the American Airlines Center in Dallas on September 23 and is scheduled to conclude at the T-Mobile Arena in Las Vegas on October 19. Collins will also be making stops in notable cities including New York City, Buffalo, Detroit, Denver, Las Vegas and San Francisco. Nothing beats the joy of watching your favorite music artist perform live! Phil Collins's concert dates are out and fans are looking forward to the upcoming shows. The next concert will be held in Vienna at the Ernst Happel Stadium on 2-Jun-19, while the last available date is for the event scheduled for San Francisco at the Chase Center on 17-Oct-19. For complete information regarding dates and venues, please visit our website. The average price for Phil Collins Tickets start from $289. The minimum get in price is $280 for Phil Collins Tickets at the Ernst Happel Stadium, Vienna. For a detailed look at ticket prices and amazing discounts, visit our website. Q:Will Phil Collins perform at the Madison Square Garden? A:Yes! The Rock and Roll Hall of Fame inductee, Phil Collins will be performing two consecutive shows at the Madison Square Garden on October 6 & 7, 2019. 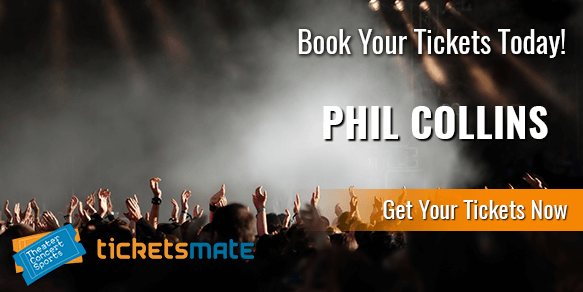 So, if you want to watch him live then purchase your Phil Collins tickets from our registered brokers at the earliest. Q:When is Phil Collins scheduled to end Not Dead Yet Tour? A:The Rock and Roll Hall of Fame inductee, Phil Collins plans to end the Not Dead Yet Tour by performing his final show at the T-Mobile Arena in Las Vegas on October 19, 2019. Our certified brokers have the tickets to that show in stock as of now so, purchase them today if you want to attend his concert live. Q:What is the setlist of Phil Collins' Not Dead Yet Tour? A:The rock music veteran, Phil Collins will be performing twenty three songs during his current tour. You can expect him to perform some of his greatest hits live including Against All Odds, Another Day In Paradise, I Don't Care Anymore, In The Air Tonight, Easy Lover and Take Me Home. Q:What information can you give me on Phil Collins 2019 tour dates? A:Phil Collins will embark on his first tour in 12 years on September 23, 2019. So far 15 dates have been announced and the itinerary includes stops in Tampa, Atlanta, Detroit, New York, Denver, and San Francisco. The last concert will take place on October 19 in Las Vegas. Phil Collins Tickets sales will begin on March 30. Q:Is Phil Collins coming to Australia? A:Phil Collins has already wrapped up New Zealand and Australian leg of his "Still Not Dead Yet Tour". As of now, he has only announced the US leg of the tour that will start from Dallas on September 23. Before hitting the US cities, he will also perform in Europe – complete list of Phil Collins Tickets is now available. Q:Are all the Phil Collins tour dates 2019 USA confirmed, or will he be adding more? A:Phil Collins has detailed 15 dates US run that starts in the fall of 2019. "Still Not Dead Yet Tour" includes stops in major cities like Houston, Tampa, Atlanta and Charlotte, and will later head out North for concerts in Detroit, Buffalo, Pittsburgh and New York City. Phil Collins Tickets are also available for Louisville, Denver, Omaha, Phoenix, San Francisco and Las Vegas. Q:Is the Phil Collins Tour 2019 Coming To a City Near Me? A:For the complete details on Phil Collins tickets and tour itinerary please browse through our website. You will find all the information regarding the dates, cities and venues. Separate tickets prices are also mentioned so that you can purchase according to your budget. So far the iconic drummer and vocalist has announced 15 US concerts. Q:After how long will Phil Collins perform in the USA? Q:Can you please tell me the cost of Phil Collins tickets for his concert in Philadelphia? A:Sure! Our reliable brokers are currently selling Phil Collins tickets for his show in Philadelphia at an average price of $494. They are also available at the get-in price of $51 right now. If you are planning to watch his show at the Wells Fargo Center then buy these concert tickets at the earliest as they are selling fast. Q:Can you please give me some details regarding Phil Collins tour dates? A:Of course! The Rock and Roll Hall of Famer Phil Collins is scheduled to kick off his 'Not Dead Yet Tour' in North America with a concert at the BB&T Center in Sunrise on October 5, 2018. He will then play his next show at the Capital One Arena in Washington on October 7, 2018. From there, Collins will go on to perform in cities such as Toronto, Brooklyn, Montreal, Columbus, Chicago and Oakland. He will be wrapping up his road trip with a performance at The Forum on October 28, 2018. Q:Is it true that Phil Collins is going to kick off his U.S. tour in 2018? A:Yes, it is true. The legendary soft rock performer is scheduled to perform in North America after a long time. He will be playing several shows later this year as part of his Not Dead Yet tour. So, if you are planning to watch him live in concert then head over to our website and purchase your Phil Collins tickets from our certified brokers today.